Holland America Line&apos;s Nieuw Statendam is set to debut in December 2018; and when the ship sets sail from the Fincantieri shipyard in Marghera, Italy it will feature distinct stateroom enhancements. The newest 2,666-guest Pinnacle-Class ship will have eight more staterooms than sister-ship Koningsdam, and all categories have been reimagined from top to bottom to showcase more thoughtful touches and innovative additions. Among the most noticeable enhancements is the redesigned Pinnacle Suite  the largest on the ship  as well as reconfigured Family Staterooms. However, Nieuw Statendam still displays all stateroom hallmarks introduced on Koningsdam, including single-cruiser accommodations, as well as a wider range of suite configurations. "As with every new ship, we&apos;ve listened to guest feedback and made our own assessments that have led to exciting changes to Nieuw Statendam that will enhance our stateroom experience across every category," said Orlando Ashford, Holland America Line&apos;s president. "Staterooms should be a sanctuary for our guests, and they are going to appreciate the elegance, functionality and extra-special touches to be found on our newest ship." Aboard Nieuw Statendam, suites offer larger, more luxurious accommodations. A grand Pinnacle Suite is an expansive 1,290 square feet with a bedroom, living room, dining area, dressing room and private verandah with whirlpool. Nieuw Statendam&apos;s Pinnacle Suite was reconfigured to offer an open-concept design with the living room and dining area in one expansive space. Guests are greeted by a spacious grand entrance, refreshed color scheme and luxe touches like custom furniture and a double-sided television. Forty-three Neptune Suites and two Neptune Spa Suites range from 465 to a generous 855 square feet. Guests in these accommodations (as well as the Pinnacle Suite) have access to the exclusive Neptune Lounge, a private place to relax, socialize with other suite guests and enjoy the personalized service of a concierge. Nieuw Statendam&apos;s Neptune Lounge was enlarged to allow for additional seating and more windows, giving a feeling of expanded openness. 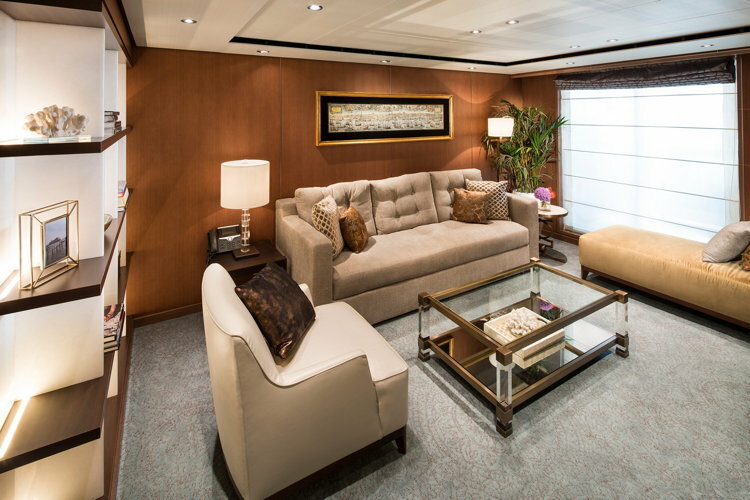 The fleetwide lounges provide worktables, a large screen television, a library, sofas and chairs, and complimentary refreshments throughout the day. Additional amenities found in all suites and staterooms include Holland America Line&apos;s signature Mariner&apos;s Dream bed with finely woven cotton linens; plush bathrobes for use during the voyage; a premium massage showerhead; flat-panel TV with video-on-demand; mini fridge; complimentary fresh fruit on request; and fragrant soaps, lotions, shampoo and other bath amenities from Elemis Aromapure. Due for delivery Dec. 1, 2018, Nieuw Statendam currently is under construction at Fincantieri&apos;s Marghera shipyard in Italy. The 2,666-guest, 99,500-ton ship will reflect the ongoing evolution of Holland America Line. From familiar elements that reflect a rich heritage and classic style to state-of-the-art enhancements that chart a bold new course forward, guests on board Nieuw Statendam will delight in details that are artfully inspired and perfectly presented to create the ultimate Pinnacle-class experience. While much of the ship&apos;s design will be similar to Koningsdam, the first Pinnacle Class ship, Nieuw Statendam will have exclusive public spaces and its own style created by leading hospitality designer Adam D. Tihany and designer and architect Bjørn Storbraaten. The ship will feature all of the hallmarks of Pinnacle-Class design: grand, light-filled spaces; visual drama; and sumptuous interiors inspired by the fluid curves of musical instruments. Holland America Line&apos;s first ship to be called Statendam sailed in 1898, and this will be the sixth ship in the company&apos;s history to carry the name. In combining the Dutch word for "new" with the classic "Statendam," Holland America Line celebrates the company&apos;s past, present and future.